Residents of the Holland Estate in London’s Spitalfields have won the battle to save their homes from the demolition proposed by registered social landlord EastEnd Homes. After a high profile campaign led to increasing local, political and media pressure, EastEnd Homes has revoked the demolition notice they served on the estate of 4 low rise mansion blocks back in 2014. Instead they have agreed to residents' requests to “undertake further consultation on repairs/refurbishment options for the blocks”. The news came through in a letter from EastEnd Homes delivered to residents over the holiday period. The future of a 5th block which was also subject to the demolition notice is uncertain. In March 2014, Eastend Homes served an “Initial Demolition Notice” as part of a feasibility study into demolishing the homes of 600 residents, a mix of social rents tenants and leasehold owner-occupiers. The charity's plans were to replace them with a new development of predominantly private flats aimed at the higher end of the housing market. Unhappy residents, faced with the prospect of losing their homes, began a campaign to fight for the estate to be refurbished rather than demolished. In the absence of any meaningful resident consultation from EastEnd Homes, the campaign launched its own petition, recording almost 90% of households to be against the demolition plans. The RSL has come under growing pressure to listen to their residents over the past 12 months as the campaign mobilised the support of other local campaigning groups, local media, politicians and Tower Hamlets Council. Local groups Tower Hamlets Federation of Tenants and Residents Associations, Tower Hamlets Renters, and the widely read Spitalfields Life blog offered early support for the campaign, which went on to be covered in national and international media. Support came from across the political spectrum with Spitalfields ward Councillor Gulam Robanni and then cabinet member for housing Councillor Rabina Khan (both of the Independent Group) backing residents. Subsequently, the Labour Mayor of Tower Hamlets John Biggs and his team reassured residents that they would not support the demolition plans nor the CPOs required to clear leaseholders from the estate whilst the majority of residents were against demolition. Bethnal Green and Bow constituency MP, Rushanara Ali took the matter up in a letter to the Minister for Housing and Planning. Meanwhile, EastEnd Homes had repeatedly tried to shut down the voice of residents through threats to the campaigners, media outlets who ran stories about the campaign, and cancellation and postponement of consultation opportunities. Residents now hope that the revocation of the demolition order and pledge to refurbish might usher in a more co-operative chapter in the relationship with their social landlord. Holland Estate was given to Eastend Homes by Tower Hamlets Council in 2006, on the condition that the housing stock be refurbished. But for 8 years, Eastend Homes ignored residents’ calls for this promise to be honoured. Instead, in 2014 they shocked residents by revealing demolition and redevelopment plans for their homes. 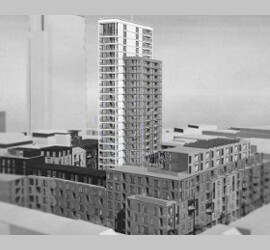 Residents have said that the charity’s proposed redevelopment scheme of a 25 storey tower block containing 263 luxury flats for sale on the private market and only 165 “affordable” homes would have amounted to indefensible overdevelopment, purely driven by the desire for profit from the luxury apartments with which they had proposed to replace the estate. They argued that the charity would have been sacrificing the welfare of the current residents that they are supposed to be helping. « Ten years on.... what went wrong! !